My translation of Demon City Shinjuku is off to the publisher (scheduled for release in August). It's an inventive YA thriller with a teenage martial arts superhero and a distinct wuxia twist. It's definitely the most accessible novel I've done for Digital Manga. Demon City Shinjuku is an omnibus volume. The second novel features as its villain: King Nebuchadnezzar II! And his awful wife, Semiramis (a prototype for Princess). Has anybody cast them in that role lately? First published in 1982, Demon City Shinjuku was Hideyuki Kikuchi's debut novel. The bulk of his work since has been based in the Demon City Shinjuku universe. The massive Yashakiden series (I'm working on the final volume now) revises and extends the themes he introduces here. 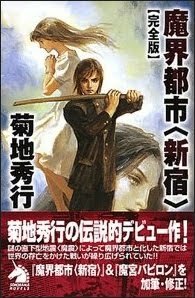 Kikuchi writes near-future fantasy and urban horror (Yashakiden moves from YA into hard-core, Joe Konrath/Stephen King territory), always risky in the prediction department. He generally sticks to monsters and magic, but in a few places the anachronisms start to show up. I still remember a passage in an Isaac Asimov novel I read as a kid that describes "miniaturized vacuum tubes," even though the field-effect transistor was first prototyped in the 1920s. The most informed science writers can fail to anticipate how some technologies will take off (and others won't). Since 2010, the entire world had been gripped in a dark curse. In the face of economic recession, growing regional conflicts, and rising crime rates, President Rama was as resolute in his actions as he was charitable in his words. And changed the world as a result. To pick nits, crime rates have fallen in developed nations (if anything, the correlation between economic recession and crime seems consistently negative). Places like Mexico and the Middle East, though, are a very different story. And Kikuchi nailed the world recession business exactly.